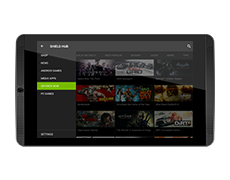 WHERE CAN I BUY THE NVIDIA SHIELD PORTABLE? Order directly from NVIDIA at shield.nvidia.com as well as our etail/retail partners: Amazon, Think Geek, Tiger Direct and NCIX. IN WHAT REGIONS IS THE SHIELD PORTABLE AVAILABLE? It's officially available in the United States, Canada, and Hong Kong. Register to be notified of SHIELD updates, including international plans. HOW DO I UPDATE THE SHIELD PORTABLE? This is a simple process. All software updates for the SHIELD portable are directly pushed out by NVIDIA. You'll see a notification when an update is available. Once you confirm, the system will automatically download and apply the update when you have sufficient battery life. What are the system requirements for streaming pc games to SHIELD? Routers: 802.11a/g router (minimum). 802.11n dual band router (recommended). Check out a list of NVIDIA GameStream™-ready routers. HOW DOES STREAMING GAMES FROM MY PC TO THE SHIELD PORTABLE WORK? NVIDIA uses the H.264 encoder built into GeForce GTX 650 or higher desktop GPUs, along with special streaming software integrated into GeForce Experience, to stream games from the PC to SHIELD over the user's home Wi-Fi network with ultra-low latency. Gamers use the SHIELD portable as the controller and display for their favorite PC games as well as for Steam Big Picture. This enables gamers to get a GeForce GTX PC gaming experience anywhere in their home Wi-Fi network. What PC games does SHIELD work with? WHAT TYPE OF MICRO USB ETHERNET ADAPTER DO I NEED TO STREAM GAMES AT 1080P @ 60 FPS? There are many different types of Micro USB Ethernet adapters available in the marketplace. The adapter must have a male Micro USB connector to a female Ethernet connector. NOTE: A Micro USB Ethernet adapter can be used, but SHIELD cannot be charged with this type of adapter. To charge SHIELD while using Ethernet, a Micro USB Y-Cable with inputs for female Micro USB, male Micro USB, and female full-size USB 2.0 will need to be used. Additionally, a full-size USB 2.0 Ethernet adapter will be needed in conjunction with the Y-Cable. Lastly, for this adapter to function properly, all external peripherals must be plugged into the Y-Cable first with the male Micro USB connector (of the Y-Cable) inputted into SHIELD last. HOW DO I MOVE APP AND GAME PROGRAM (APK + OBB) FILES FROM THE SHIELD PORTABLE'S INTERNAL STORAGE TO THE MICROSD CARD? SHIELD only supports writing to FAT32 formatted cards. This is a limitation of Android. 32 GB (or less) microSD cards – SHIELD supports FAT32 data format. Most microSD cards that are 32 GB or less are already formatted as FAT32. If the memory card is not formatted, format to FAT32, using your PC or Mac computer. 64 GB (or higher) microSD cards – Android does not support the exFAT file system out-of-the-box. Because the standard FAT32 file system does NOT support partitions greater than 32 GB by default, 64 GB cards come pre-formatted as exFAT. If you want to use a 64 GB microSD with SHIELD, it has to be converted to a file system format that is supported by stock Android, which in this case is NTFS. This can be done using a PC. KitKat significantly changes the way applications are allowed to use SD cards. If you use SD Card to store data, please read here for further details. WHAT CONTROLLERS ARE COMPATIBLE WITH THE SHIELD PORTABLE IN CONSOLE MODE? NVIDIA recommends the SHIELD controller for the ultimate gaming experience. The SHIELD controller was built from the ground up to work perfectly and seamlessly with the SHIELD portable. How can I share my SHIELD's Gamepad Mapper profiles with the community? With the community profiles feature in Gamepad Mapper, users can share, browse, and rate community generated game profiles. To access the feature, hold the Start button from within an Android game to access the GamePad Mapper user interface, then select either the browse (cloud icon with a green down arrow) or share button (green share icon to the right of the browse button) to access the community features. WHAT ANDROID GAMES DOES THE SHIELD PORTABLE WORK WITH? As this is a full-featured Android device with a multi-touch screen and access to the Google Play store, gamers can access and play an extensive catalog of Android games. For the SHIELD portable, games optimized for gamepads and 5" landscape displays are going to provide the best gaming experience. Check out the list of SHIELD-optimized games available from NVIDIA SHIELD Hub. Beyond the many great titles available through SHIELD Hub, there are a number of other games available on Google Play that offer native controller support. Check out a list of tested Android games. The SHIELD portable provides a full precision controller with two joysticks, a D-pad, ABXY buttons, L/R bumpers, L/R analog triggers, Start/Back/Home/Volume buttons, and a multi-function NVIDIA/Power button. WHAT ARE THE RECOMMENDED MIRACAST DEVICES? NVIDIA has tested with a variety of Miracast devices and recommends Actiontec ScreenBeam Pro with firmware release 1.1.0.93 or higher for best compatibility with SHIELD. For ScreenBeam owners, download the latest Actiontec ScreenBeam firmware here and learn how to update the firmware here. WHAT IS THE WARRANTY ON THE SHIELD PORTABLE? 1-year limited manufacturer's warranty. Warranty details.